Status Quo are an English rock band who play boogie woogie rock. The group originated in The Spectres, founded by Francis Rossi and Alan Lancaster in 1962, while still schoolboys. After a number of lineup changes, which included the introduction of Rick Parfitt in 1967, the band became The Status Quo in 1967 and Status Quo in 1969. They have had over 60 chart hits in the UK, more than any other rock band, including "Pictures of Matchstick Men" in 1968, "Whatever You Want" in 1979 and "In the Army Now" in 1986 and 2010. Twenty-two of these reached the Top 10 in the UK Singles Chart. In July 1985 the band opened Live Aid at Wembley Stadium with "Rockin' All Over the World". In 1991, Status Quo received a Brit Award for Outstanding Contribution to Music. Status Quo starred in their first feature film, Bula Quo!, which was released to cinemas in July 2013. The film coincided with the release of the soundtrack album Bula Quo!, which peaked at number 10 in the UK Albums Chart. The first single from the album, "Bula Bula Quo" was released in June 2013, and is Status Quo's one hundredth single release. Status Quo was formed in 1962 under the name "the Scorpions" by Francis Rossi and Alan Lancaster at Sedgehill Comprehensive School, Catford, along with classmates Jess Jaworski (keyboards) and Alan Key (drums). Rossi and Lancaster played their first gig at the Samuel Jones Sports Club in Dulwich, London. In 1963, Key was replaced by John Coghlan and the band changed name to "The Spectres". In 1965, when Rossi, Lancaster, and Jaworski had reached the end of their school education, Jaworski opted to leave the band, and was replaced by Roy Lynes. They began writing their own material and later that year met Rick Parfitt who was playing with a cabaret band called The Highlights. By the end of 1965, Rossi and Parfitt, who had become close friends after meeting at Butlins, made a commitment to continue working together. On 18 July 1966, The Spectres signed a five-year deal with Piccadilly Records, releasing two singles that year, "I (Who Have Nothing)" and "Hurdy Gurdy Man" (written by Alan Lancaster), and one the next year called "(We Ain't Got) Nothin' Yet" (a song originally recorded by New York psychedelic band The Blues Magoos). All three singles failed to make an impact on the charts. By 1967, the group had discovered psychedelia and named themselves Traffic, but were soon forced to change it to "Traffic Jam" to avoid confusion with Steve Winwood's Traffic, following an argument over who had registered the name first. The band secured an appearance on BBC Radio's Saturday Club, but in June their next single, "Almost But Not Quite There", underperformed. The following month saw Parfitt, at the request of manager Pat Barlow, joining the band as rhythm guitarist and vocalist. Shortly after Parfitt's recruitment, in August 1967, the band officially became The Status Quo. In January 1968 the group released the psychedelic-flavoured "Pictures of Matchstick Men". 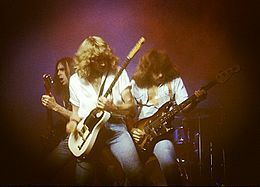 Rick Parfitt was invited to join the band just as the song hit the UK Singles Chart, reaching number seven; "Matchstick Men" additionally became the group's only Top 40 hit in the United States, peaking at number twelve on the Billboard Hot 100. Although Status Quo's albums have been released in the United States throughout their career, they never achieved the same level of success as they have in their home country. Though the follow-up was the unsuccessful single, "Black Veils of Melancholy", they had a hit again the same year with a pop song penned by Marty Wilde and Ronnie Scott, "Ice in the Sun", which climbed to number eight. After the breakthrough, the band management hired Bob Young as a roadie and tour manager. Over the years Young became one of the most important songwriting partners for Status Quo, in addition to playing harmonica with them on stage and on record. After their second album Spare Parts failed commercially, the band abandoned psychedelia and Carnaby Street fashions in favour of a hard rock/boogie sound, faded denims and T-shirts, an image which was to become their trademark throughout the 1970s. Lynes left the band in 1970 and was replaced in the studio by guests including keyboard player Jimmy Horowitz and Tom Parker. By 1976, ex-The Herd, Judas Jump and Peter Frampton Band member Andy Bown was brought in to cover keyboards although as he was contracted as a solo artist with EMI he was not credited as an official member of Status Quo until 1982. After two relatively poor-selling albums, Ma Kelly's Greasy Spoon and Dog of Two Head in 1970 and 1971, their major breakthrough came when they signed with the heavy rock and progressive label Vertigo. Their first album for Vertigo, Piledriver, was released in 1972 and heralded an even heavier, self-produced sound. This album was essentially the stylistic template for each album they released up until Blue for You in 1976. Quo's more popular songs from this era include "Paper Plane" (No 8 in the |UK chart) (1972), "Caroline" (No 5 in the UK chart) (1973), "Break The Rules", (No 8 in the UK Chart) (1974), "Down Down" (No 1 in the UK chart) (1975), "Rain" (No 7 in the UK chart) (1976), "Mystery Song" (No 11 in the UK Chart) (1976), "Rockin' All Over the World" (No 3 in the UK chart) (1977) and "Whatever You Want" (No 4 in the UK Chart) (1979). "Down Down" topped the UK Singles Chart in January 1975, becoming their only UK No 1 single to date. In 1976, they signed a pioneering sponsorship deal with Levi's. Quo have now sold approximately 118 million records worldwide. From 1977 onwards, the band's sound became more polished as they began to employ outside producers. These included Pip Williams, Roger Glover, and John Eden. Glover was the first outside producer to work with Quo since Pye's John Schroeder in the early 1970s, and produced "Wild Side of Life" and its B-side "All Through The Night" in 1976. 1977's Rockin' All Over the World's title track, a minor hit for its writer John Fogerty (formerly of Creedence Clearwater Revival) became one of Status Quo's most enduring anthems. Sales remained high in the UK throughout the 1980s. Tensions within the band saw Coghlan leaving late in 1981. His replacement early the following year was Pete Kircher from the 1960s pop band Honeybus. It was at this time that Andy Bown joined the band in an official capacity. Although contracted to record more albums, this line-up played its last full-length gig on 21 July 1984 at the Milton Keynes Bowl. "Everybody was coked-up and hating each other," Rossi recalled, "and I'd started drinking tequila on that tour. I don't remember that show at all – the encores or anything; just falling flat on my back at one point." "Deciding to retire from the road – all that was about was getting Francis a solo career," declared Lancaster. "Nobody on the outside knew it, but he didn't want to work with me or Rick anymore." 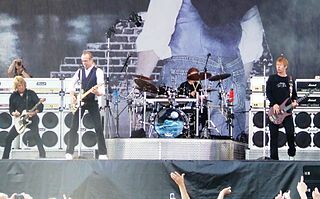 Status Quo's final appearance with the Kircher line-up opened the Live Aid charity event at Wembley Stadium in July 1985. That year, Rossi recorded and released two solo singles with long-time writing partner Bernie Frost. Parfitt recorded a solo album, Recorded Delivery, with bass player John "Rhino" Edwards and drummer Jeff Rich. The album remains unreleased, although some tracks were reworked and released sporadically as Quo B-sides until 1987. In mid-1985, Rossi, Parfitt and Bown, with Edwards and Rich, started work on a new Quo album. Lancaster – by this time more or less settled in Australia – took out a legal injunction to stop the band using the Status Quo name on records, citing increasing musical differences, notably during sessions for 1983's Back to Back. The specific dispute concerned two tracks that became hits for the group around that time. Lancaster had written "Ol' Rag Blues", but was angered when the producers chose to release a version with Rossi singing the lead vocal instead of one sung by himself. The injunction also prevented the release of a single, "Naughty Girl", for which a catalogue number was issued by Vertigo. An out-of-court settlement was made in January 1986, enabling the new Quo to continue recording In The Army Now, for which "Naughty Girl" was reworked as "Dreamin'". Lancaster remained in Australia, and in 1986 joined an Australian super group, The Party Boys, featuring Angry Anderson of Rose Tattoo, John Brewster of The Angels and Kevin Borich, but achieved little success outside Australia. Lancaster left Status Quo formally in 1987. In 1986, Quo supported Queen on the latter's Magic Tour. The commercially successful In the Army Now album was released later that year. Its title track became one of the band's biggest UK singles, reaching number 2. The following album, Ain't Complaining, in 1988, was less successful but produced the number 5 hit "Burning Bridges". Rerecorded (with new lyrics) in April 1994 with Manchester United F.C. as "Come On You Reds", the single would have given the band their second UK Number 1, but it was credited as 'by Manchester United'. The early-to-mid-1990s saw falling album sales for the band. To promote the release of the Rock 'Til You Drop album (1991), Quo performed four arena gigs in Sheffield, Glasgow, Birmingham and London in the space of 12 hours, earning them a place in the Guinness Book of Records. The 1994 Quo album Thirsty Work included a cover of the Jennifer Warnes song "I'm Restless" revealing an alternative and lighter sound to the band. Don't Stop (1996), and Famous in the Last Century (2000) consisted almost entirely of cover versions, (with the only exception being the title track to the latter). The former brought some chart success for Quo with covers of Fleetwood Mac's "Don't Stop" and The Beach Boys' "Fun, Fun, Fun". The band became involved in an acrimonious dispute with Radio 1 after the station refused to include the "Fun Fun Fun" single on the radio station's playlist. In 1993, Francis Rossi and Rick Parfitt attracted a crowd of over 25,000 when they performed the annual Blackpool Illuminations lights switch on. Parfitt underwent quadruple by-pass surgery in 1997 but was able to make a full recovery and returned with a performance at the Norwich City Football Club ground three months later. Status Quo also returned to Australia in 1997, completing their first tour there since 1978. A greatest hits compilation, Whatever You Want – The Very Best of Status Quo was also released, achieving silver sales in the UK that year. In 1999, Quo toured Germany, the Netherlands and Switzerland. Dubbed the 'Last Night of the Proms', the band were backed by a full orchestra during the concerts. Rich left in 2000 and was replaced by Matt Letley. Andrew Bown also took a year off at the same time following the death of his wife, and was temporarily replaced on stage by Paul Hirsh, formerly of Voyager. In November 2000, the band played a gig at Grandchester in the outback in Australia, performing on a carriage of Australia's Orient Express, the Great South Pacific Express. In 2005 Rossi and Parfitt made cameo appearances in the long-running ITV soap opera Coronation Street in a storyline which involved them being sued by the notorious layabout Les Battersby, and performing live at his wedding as compensation. In December 2005, it was announced that Parfitt had been taken ill and was undergoing tests for throat cancer. All subsequent dates of the UK tour were cancelled as a result. However, the growths in Parfitt's throat were later found to be benign and were successfully removed. In May 2006, a fully recovered Parfitt and the band returned to the NEC Birmingham to play the show that they had postponed in December. This was their 40th show at the venue, and was recorded for a DVD, entitled "Just Doin' It". On 1 July 2007, they performed in front of 63,000 people at the newly built Wembley Stadium as part of the Concert for Diana. They also appeared on the TV programme Tiswas Reunited, in which the band got the usual greeting of custard pies and buckets of water whilst playing the song, "Gerdundula". Their twenty-eighth studio album, In Search of the Fourth Chord, was released on the band's own Fourth Chord label in September 2007 in the UK, and on Edel Records in the rest of Europe. Produced by veteran producer Pip Williams, who had worked with Quo in the studio since 1977, the album was only moderately successful. In 2008, they teamed up with German techno group Scooter to record a jumpstyle version of their 1979 single "Whatever You Want" entitled "Jump That Rock (Whatever You Want)". In December 2008, they released their 75th single and first Christmas single, entitled "It's Christmas Time", which peaked at No. 40 in the UK Singles Chart. 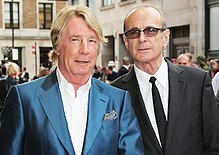 Rossi and Parfitt were each awarded the OBE in the 2010 New Year Honours for services to music. Their long-standing work for charities includes The Prince's Trust, British Heart Foundation and Nordoff-Robbins Music Therapy. Classic Rock magazine had reported on 17 March 2010 that the band had patched up their relationship with Alan Lancaster, and were discussing the possibility of a future collaboration. The article stated "While the band are back on friendly terms with Alan, it's unlikely we'll see any future reunion, with Quo continuing as normal and Lancaster busy with charity events and overseeing the activities of his son's band The Presence". On 20 September 2010, Status Quo was honoured with a PRS for Music plaque commemorating their first gig at the Welcome Inn in Well Hall Road, Eltham, where the band first performed in 1967. On 26 September 2010, a new version of "In the Army Now" was released through Universal / UMC. All profits from this updated and lyrically reworked version will be donated equally to the British Forces Foundation and Help for Heroes charities. A box set of sessions, live concerts and TV appearances at the BBC was released on 25 October 2010, titled Live at the BBC. The full 7CD version (+DVD) covers almost all appearances, while the 2CD and 4CD version present some highlights. Their twenty ninth studio album, Quid Pro Quo, was released in a deluxe format exclusively at Tesco on 30 May 2011. The regular edition was released elsewhere on 7 June. The album peaked at number 10 in the UK chart. December 2011 saw Status Quo undertake their first all-arenas UK winter tour. Quo also performed for the first time at The O2 in London. The tour was dubbed Quofest and featured Roy Wood and Kim Wilde as support for all shows. They joined the band during the encore. In August 2011, Status Quo began filming their first cinematic documentary with film director Alan G. Parker. Entitled Hello Quo!, the production opened in cinemas on 22 October 2012. A Blu-ray/DVD release followed, through Anchor Bay Productions, on 29 October. The movie included contributions from Brian May, Jeff Lynne, Cliff Richard, Joe Elliott, Paul Weller, Joe Brown, Jim Lea, Andy Scott and Steve Diggle. In April 2012, Status Quo announced they were shooting their first feature film, over several weeks in Fiji. A 90-minute action comedy, entitled Bula Quo!, taking its name from the islanders' traditional Fijian greeting, and also referencing the title of the band's best-selling album, Hello! featuring the band as themselves, and also starring Jon Lovitz, Craig Fairbrass and Laura Aikman. The film was directed by Stuart St. Paul, produced by Tim Major and was released in cinemas on 5 July 2013. The film was accompanied by a soundtrack album of the same name, the band's 30th studio album, released on 10 June. It featured nine new songs and ten re-records and live tracks, and debuted in the UK chart at number 10. On 9 July 2012, the band released the single "The Winner" for the 2012 Summer Olympics. In July 2012 Coles, an Australian national supermarket chain, signed Status Quo to record a version of "Down Down" using Coles' tag line 'Down, down, prices are down'. In November 2012, Coles continued their association with Status Quo, producing a series of television adverts with the band appearing and performing "It's Christmas Time". In 2013, new adverts were released by Coles with Quo using "Whatever You Want" as the new jingle. In December that year, Quo toured under the Quofest banner for a second year, this time supported by Bonnie Tyler and Eddie and the Hot Rods. On 17 December 2012, Matt Letley announced his decision to leave the band after 12 years, and subsequently departed following completion of their 2012 winter tour. However, Letley toured with Quo their Australia and Mexico tour in March and April 2013, due to limited time to find a new drummer after the Frantic Four Tour. The 1970–76 line-up (Francis Rossi, Rick Parfitt, Alan Lancaster and John Coghlan) reunited in March 2013 for a series of dates in Manchester, Wolverhampton, Glasgow and London. The last date of the tour, at Wembley Arena on 17 March, was filmed for a DVD, released in September 2013. In May 2013 Leon Cave became Quo's new drummer. In the latter months of 2013, Status Quo embarked on their Bula Quo tour, supported by Uriah Heep on German dates, and by 10cc in the UK. This was followed by nine concert dates in the UK during 2014. On 25 November 2013, it was announced that Status Quo would headline the second stage at the Download Festival in June 2014. In January 2014, Wychwood Brewery announced they would be releasing a Status Quo brand of beer, named after their 1972 album Piledriver, exclusively in JD Wetherspoon pubs across the UK in February, before going on general sale in April. March 2014 saw the second 'Frantic Four' reunion tour featuring Rossi and Parfitt with original members Alan Lancaster and John Coghlan with their last gig being at The O2 in Dublin. Rossi indicated that this would be the last ever reunion tour of the 'Frantic Four' line-up. On 8 March 2014, Rossi and Parfitt appeared on ITV show Ant & Dec's Saturday Night Takeaway performing "Rockin' All Over the World" with McBusted. In August 2014, it was reported that founding keyboardist Jess Jaworski had died. In October 2014, Parfitt and Rossi appeared on BBC's The One Show, performing an acoustic version of "Pictures of Matchstick Men". In May 2015, the twosome appeared on BBC's Later... with Jools Holland, to talk about their Aquostic (Stripped Bare) album. On 9 May 2015, they performed "In the Army Now" at the VE Day 70: A Party to Remember. On 22 October 2014 the band launched the Aquostic album with a 90-minute performance at London's Roundhouse, with the concert recorded and broadcast live by BBC Radio 2 as part of their In Concert series. Footage from the concert was later used, interspersed with interviews with Rossi and Parfitt, in BBC Four's Status Quo: Live and Acoustic, in January 2017. 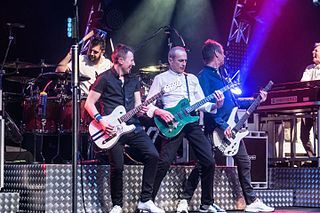 On 5 June 2015 Status Quo were the headline act at Palmerston Park in Dumfries, at the stadium of Queen of the South and were supported by Reef and Big Country, in the first ever live concert at the venue. On 1 February 2016, it was officially announced that Status Quo, in addition to the spring and summer dates already scheduled, would tour Europe starting in October. The final dates would take place in the UK towards the end of the year, after which the group would retire from playing 'electric' tours. The 'Last of The Electrics' tour was subsequently extended into 2017, with additional concerts outside the UK. In September 2016 the band performed, in Aquostic line-up, at BBC Radio 2's Live in Hyde Park from Hyde Park, London. The band's latest album Aquostic II – That’s a Fact! was released on 21 October 2016. On 28 October 2016, Parfitt permanently retired from live performances after suffering a heart attack earlier the same year. On 24 December, he died in hospital in Marbella, Spain as a result of severe infection, after suffering an injury to his shoulder. Parfitt's funeral was held at Woking Crematorium on 19 January 2017. Irish guitarist Richie Malone, who had substituted for Parfitt during some 2016 live shows, took his place on rhythm guitar. The band had to postpone a concert in June 2017 after frontman Rossi became ill.. In November 2018 it was announced that the band would be the special guests for Lynyrd Skynyrd on their UK farewell tour in late summer 2019. In 1989, American alternative rock group Camper Van Beethoven scored a number one hit on Billboard magazine's Modern Rock Tracks chart with a cover version of "Pictures of Matchstick Men". The song is from their album Key Lime Pie. The 1996 re-issue of the album Too-Rye-Ay by Dexys Midnight Runners contained a cover version of "Marguerita Time". Ozzy Osbourne, backed by Type O Negative, covered "Pictures of Matchstick Men" as part of the soundtrack to the Howard Stern biographical movie Private Parts in 1997. Towards the end of his life, DJ John Peel was known for playing "Down Down" as part of his eclectic DJ sets. Arjen Lucassen (from the Dutch project Ayreon) covered "Pictures Of Matchstick Men" and "Ice in the Sun" on his solo album Strange Hobby. Bad Religion guitarist Brett Gurewitz recorded a cover version of "Pictures of Matchstick Men", on his 1985 solo album Seeing Eye Gods. German Power metal band Helloween covered "Rain" for their single "Power". It can also be found on the bonus disc of the special edition of their 1996 album, The Time of the Oath. ^ a b c d e f g h i j k l m Roberts, David (1998). Guinness Rockopedia (1st ed.). London: Guinness Publishing Ltd. p. 417. ISBN 0-85112-072-5. ^ "Status Quo hold UK singles record". BBC News. 19 September 2005. Retrieved 14 February 2009. ^ "Status Quo celebrate release of their 100th single 'Bula Bula Quo'". The Independent. 10 June 2013. Retrieved 10 June 2013. ^ Young, Bob (2000). Status Quo: Just Doin' It! (1st ed.). London: Cassell Illustrated. p. 27. ISBN 1-84403-562-X. ^ a b c d e f g h Strong, Martin C. (2000). The Great Rock Discography (5th ed.). Edinburgh: Mojo Books. pp. 927–929. ISBN 1-84195-017-3. ^ "QUOTICKER - Year review 1965". Quoticker.de. Retrieved 22 August 2018. ^ "QUOTICKER - year review 1967". Quoticker.de. Retrieved 22 August 2018. ^ "QUOTICKER - year review 1970". Quoticker.de. Retrieved 22 August 2018. ^ Rice, Jo (1982). The Guinness Book of 500 Number One Hits (1st ed.). Enfield, Middlesex: Guinness Superlatives Ltd. p. 164. ISBN 0-85112-250-7. ^ "Quo Facts". Statusquo.co.uk. Retrieved 15 July 2011. ^ Ling, Dave (January 2002). "Again again again…". Classic Rock #36. p. 69. ^ Ling, Dave (January 2002). "Again again again…". Classic Rock #36. p. 73. ^ "Home". Scootertechno.Com. 22 October 2013. Retrieved 26 October 2013. ^ "The Official Site". Status Quo. Retrieved 26 October 2013. ^ a b "Quo Kiss And Make Up With Former Bassist | News, Top Posts | Classic Rock". Classicrockmagazine.com. 17 March 2010. Retrieved 26 October 2013. ^ "Status Quo black plaque in London". Openplaques.org. 20 September 2010. Retrieved 21 May 2013. ^ "Entertaim.net: interview with the GOMORR". Entertaim.net. 25 October 2013. Retrieved 26 October 2013. ^ a b "Status Quo Add Drummer Leon Cave To Band Line-up". Bravewords.com. Retrieved 24 May 2013. ^ "National News : Coles bags Status Quo for latest ad campaign". Heraldsun.com.au. Retrieved 26 October 2013. ^ "Status Quo Tickets – Tour 2014". Giga-music.co.uk. Retrieved 26 October 2013. ^ "Status Quo frontman: 'If I dropped dead tomorrow, what a fantastic f**king life I've had'". The Irish Times. Retrieved 10 April 2014. ^ "McBusted vs McDonnelly". itv.com. 8 March 2014. Retrieved 12 July 2017. ^ "Status Quo "The Frantic Four" Reunion Tour". Facebook.com. Retrieved 22 August 2018. ^ "BBC One - The One Show, 20/10/2014". BBC. Retrieved 21 October 2014. ^ "VE Day 70, Horse Guards Parade, review: 'rousing ovations and spiffing period dress'". telegraph.co.uk. 10 May 2015. Retrieved 8 September 2016. ^ "Status Quo Concert Setlist at Roundhouse, London on October 22, 2014 - setlist.fm". setlist.fm. Retrieved 25 February 2015. ^ "Status Quo - Acoustic". Radio 2 In Concert. bbc.co.uk. Retrieved 25 February 2015. ^ "Status Quo: Live and Acoustic - BBC Four". BBC. Retrieved 22 August 2018. ^ Dalziel, Magdalene (3 March 2015). "Big Country providing Quo support in Dumfries". Dailyrecord.co.uk. Retrieved 22 August 2018. ^ "Last chance to see Status Quo in Somerset, after they announced they will quit at end of the year". Western Daily Press. 27 January 2016. Archived from the original on 1 February 2016. Retrieved 1 February 2016. ^ "Radio 2 Live in Hyde Park - Status Quo". bbc.co.uk. 11 September 2016. Retrieved 11 September 2016. ^ "Aquostic". Status Quo. Retrieved 29 November 2016. ^ "Rick Parfitt quits performing with Status Quo for good - BBC News". Bbc.co.uk. Retrieved 29 November 2016. ^ "Status Quo - Further to various previous announcements and..." Facebook. 28 October 2016. Retrieved 29 November 2016. ^ "Rick Parfitt, Status Quo guitarist, dies in Spain at 68". Global News. Retrieved 8 July 2017. ^ "R.I.P. Status Quo's Rick Parfitt, the Man Who Changed How I Hear Rock". Observer. 5 January 2017. Retrieved 8 July 2017. ^ "Status Quo's Rick Parfitt dies aged 68". BBC News. 1 January 1970. Retrieved 24 December 2016. ^ "Status Quo". statusquo.co.uk. February 2017. Retrieved 26 February 2017. ^ Simpson, George (24 June 2017). "Status Quo: Francis Rossi illness forces band to postpone concert". Express.co.uk. Retrieved 8 July 2017. ^ Mugan, Chris (7 December 2002). "John Peel's comments on playing 'Down Down', in The Guardian". London. Retrieved 24 May 2010. Francis Rossi, Rick Parfitt, Bob Young: Status Quo": The Official 40th Anniversary Edition . Cassell Illustrated, Oktober 2006, hardcover, ISBN 978-1-84403-562-5. Wikimedia Commons has media related to Status Quo (musical group).